← Big, Mean, Green Machine! Fun fact: Americans consume, on average, up to 3,436 mg of sodium a day. Let’s add another fun fact to put this in perspective: our body only needs 180-500 mg of sodium each day and the recommended adequate intake level is set at 1,500 mg a day! That’s a lot of salt! As of recently I am sure I was one of those American’s consuming way too much salt as my Emeril kitchen prowess was limited to adding garlic salt to just about EVERYTHING. So, in an effort to limit that intake I have recently become obsessed with cooking with water. Sounds dull and tasteless doesn’t it? Not if it’s done correctly, which is surprisingly easy to master. My biggest recipe for success has become poached salmon. The poaching allows the salmon to soak up the flavors of the herbs and spices you have added to the water without the use of salts, sugars, or oils of any kind…it becomes the ultimate healthy meal, and here’s how it’s done. Set your salmon in a skillet and fill with water until it reaches half way up the salmon. Add your spices and herbs, garlic, and lemon juice to the water as well as on top of the salmon so it soaks in all the great flavors. Turn the heat to high until you reach a nice simmer and cover. Turn heat down to maintain simmer. Let cook for about 10 minutes or until cooked through. Typically salmon will turn a nice opaque or pale pink color when cooked. However, some do not so here’s an easy way to test for doneness. cut the very side of the salmon to see if it’s flaky. Do not cut the middle! Presto! You have yourself a savory and healthy salmon dish….but what about for a side? Well here was my theory. If I sautéed spinach in water and garlic and covered it, the spinach would absorb the flavor just like the salmon right? Exactly! So, here is the recipe for a delicious and healthy spinach side dish…no butter added! Sautéed Spinach Ingredients: Once again the amounts of each ingredient here will vary by taste so experiment a bit. Place spinach and minced garlic in skillet with just enough water to wet it and act as the oil or butter typically would. Cover, stirring and checking often for doneness. As the leaves start to cook and the water begins to evaporate, add some pecan halves in to toast them up a bit. Spinach will be wilted but still a dark green color once done. Add lemon to taste and sprinkle some red pepper flakes over the top. Finally, set your salmon on the bed of spinach and enjoy! It goes great with a nice cup of iced green tea for an added antioxidant blast. Just remember, this is only one way to limit your salt (and sugar and oil) intake. A few other good alternatives are using things like garlic powder instead of garlic salt or cinnamon instead of cinnamon sugar. It’s amazing the flavors you can come up with just by digging through your spice cabinet and experimenting. If you have premixed seasonings you usually grab for, just be sure to read the ingredients for added salts and sugars as they are usually lurking in there. Have fun with your meals, it makes eating healthy a lot more fun! 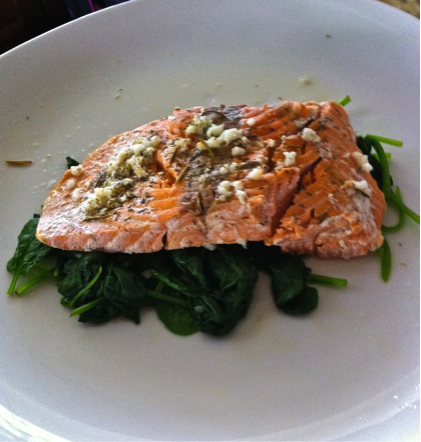 This entry was posted in Recipes and tagged fat free, no oils, no salt, no sugar, poached salmon, spinach. Bookmark the permalink.